After a weekend of naughty eating and drinking my weight in beer (yuk!) I'm going on a veggie burger fast. Veggie burgers will make me feel better about my food choices, right? That little voice in my head will stop berating me for eating 3 bags of Australian licorice last week - RIGHT? Ahem. Yes. You are still here? The title of this recipe has roasted garlic as the first two words - so as to warn people. It's garlicky. Which, for me, I love. Especially when roasted to a sugary, mellowed-out garlic flavor. Others - maybe not so much. You might consider throwing half the head of garlic, instead of the whole head. Here's how you roast the garlic. Very simple. After slicing a whole garlic head in half season with salt, pepper and olive oil. Wrap tightly in foil and bake at 375 for 1 hour. Place on a cookie sheet so it doesn't decorate the bottom of your oven. Have you ever used your food processor to "french" green beans? Why have I been living in the dark ages for so long? 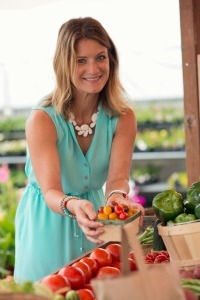 It's so fun to do (Yes, I have "fun" with green beans)! These beans were kinda too big when they were picked, so I thought it would be a great way to make them more tasty - and I was right! All you do is prep your beans by taking off the ends, snap in half and feed down the tube of the food processor while its running. I feel like Mega-mind right now! 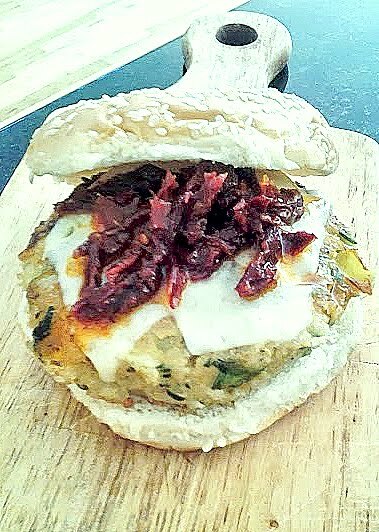 This recipe has a lot of prep, but it makes 8 burgers so you can enjoy all week for dinner and don't have to cook again! That's how I roll! I enjoyed mine with lettuce and a shmear of mayo, but you may like yours with sun-dried tomatoes and/or fresh tomato slices, as suggested in Food & Wine. Preheat oven to 375. 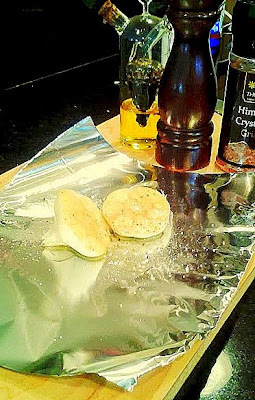 Arrange the garlic halves cut side up on a sheet of foil, drizzle with oilive oil and season with salt and pepper and wrap tightly. Roast until the garlic is very tender, about 1 hour. Let cool, then squeeze the cloves out of their skins. Fill a medium-sized saucepan with about 1 1/2 cups of water and the wheat berries, cover. Bring to a boil and cook until tender and chewy, about 1 hour. May need to add more water. Drain off excess when cooked. Cool. Fit a food processor with the slicing blade. 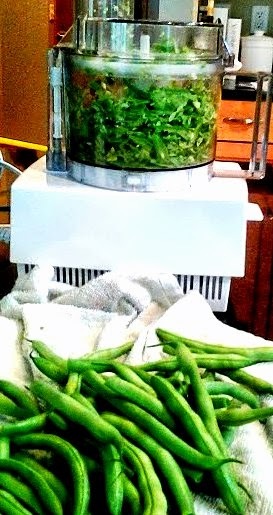 While its running feed green beans into food processor. Meanwhile, bring a saucepan of salted water to a boil. 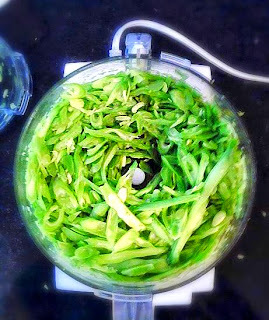 Drop green beans into boiling water and cook for 2 minutes. Strain out beans. Submerge beans into ice water. Drain well and let cool slightly. In the food processor, puree chickpeas, garlic and 2 tablespoons of olive oil. Transfer mixture to a bowl. 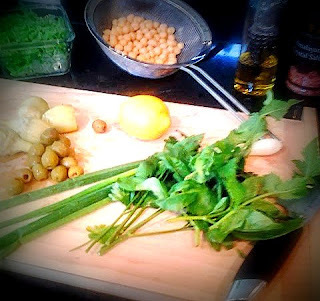 Stir in the green beans, wheat berries, artichokes, olives, green onions, yogurt, lemon juice, herbs and quinoa. Season with salt and pepper. Heat a large cast-iron skillet and brush with olive oil. Using lightly moistened hands, form the mixture into eight 3-inch patties. 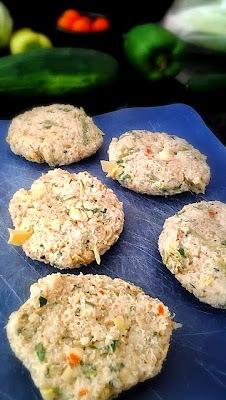 Brush the patties with olive oil and cook over high heat until golden on the bottom, 4 minutes. Flip the patties and top each with a slice of cheese. Reduce heat to moderate, cover and cook until the patties are heated through and golden on the bottom and the cheese is melted. Set the burgers on the buns and top with sun-dried tomatoes and lettuce.